Jack is an enthusiastic fundraiser for the Arthritis Society of Quebec. For the Scotiabank Charity Challenge on April 24, he’ll be captain of a “Green Team” of runners raising money for juvenile arthritis. Last year, he ran the 5K and he plans on doing the same this year. It’s quite a feat for any twelve-year-old, but what makes it even more remarkable is that Jack himself has juvenile idiopathic arthritis. When Jack was seven years old, one of his big toes became enlarged. It soon spread to the other big toe and his ankles. An avid soccer player, he went from being the most active kid on the field to not being able to run at all. His parents Rosina and Jim took him to several different doctors but it was a chance meeting with a resident working at a local clinic that led them to the MCH division of Rheumatology. In late 2010, they met pediatric rheumatologist, Dr. Gaëlle Chédeville, and nurse Gillian Taylor, who recently retired. For children with arthritis, mornings can be difficult. After waking up, Jack would often have to be carried downstairs. He’d go to school on crutches but by lunchtime, he could move better so he’d put the crutches aside. A lot of his classmates thought he was faking, so Jack decided to help them understand arthritis better. Although he had made progress on methotrexate, Dr. Chédeville felt he could improve even more with the help of an injected medication called Enbrel. Within two to three weeks, they could see the results and Jack has now been pain-free for two years. Living without pain has helped Jack be active again. 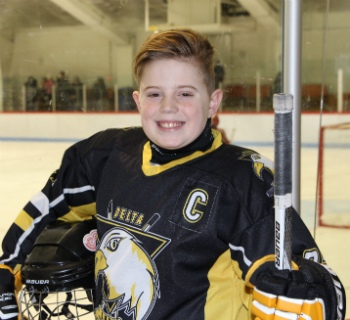 He continues to play soccer and also took up hockey, a dream that gave him hope when he was in pain. He’s now captain of his level B hockey team. He’s also the Arthritis Society spokesperson for Childhood Arthritis Month this March. 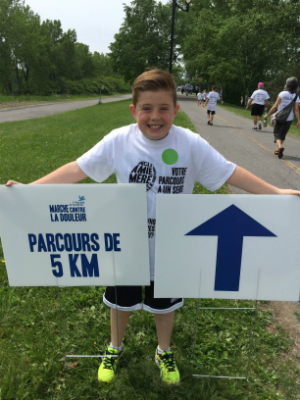 Along with his parents, he’s getting ready for their 4th annual fundraiser on March 19 at Au blanc d’œuf in Laval, to raise money for the Walk to Fight Arthritis on June 5. As Jack prepares for the Scotiabank 5K, he hopes to raise even more money than last year since the proceeds will help some of his friends spend the week at Camp Articulation, a one-week camp for children with juvenile arthritis.